Imagine academics were more like a caricature of elected politicians: shouting their beliefs from the rooftops, super-selective with their interpretations of fact, unwilling to express uncertainty about anything political if it harmed their case, and willing to make wildly unsubstantiated predictions about the future. The new Scotland Bill represents the final devolution settlement. This is the last chance to get devolution right before the next independence referendum. Instead, it is a horrible mess, produced in a hurry and driven more by political negotiation than good sense (which is the usual story). The fiscal framework underpinning the new settlement is a shambles and not worthy of support (David Bell and colleagues use the phrase ‘may not be workable’ when the plan contains contradictory principles). The idea of a powerful Scottish Parliament overseeing incredibly high fiscal autonomy is absolute nonsense, because the Scottish Government does not have the ability to decide who should win and lose from the tax and spending regime (Bell and colleagues say ‘these taxes do not give the Scottish Government a great deal of flexibility in reality’). Politicians would rather discuss their back of the envelope plans in private because they know that they would not stand up to scrutiny if they had to explain them to the general public (Nicola McEwen uses the phrase ‘After the democratic engagement of the referendum campaign, it is disappointing that debates on the Scotland Bill have largely excluded the public’). If so, I pity the people charged with running the next No campaign, because they will be unable to say that (a) the Scottish devolution settlement is good, or (b) there will be a further settlement if you vote No (nor will they be able to make a convincing case based on British values). Instead, what they can say is ‘we delivered on our promise for more devolution’ and, perhaps, ‘use the powers you have before you ask for more’. The general problem with the latter argument is that it currently boils down to this kind of specific argument: if you don’t like UK Conservative cuts to benefits and tax credits, you can now raise taxes to offset them (then, presumably, the plan is to say ‘you didn’t raise taxes, so you are not as social democratic as you claim’). What I suspect many people will hear is this: we agree that the Tory cuts are rubbish, and you have to pay more money to get back to where you started. In that context, the SNP still has the choice of saying that its hands are tied by the Tories or that it can only do so much to offset the damage. We are not yet, and perhaps never will be, at the stage where people will hold an SNP-led Scottish Government primarily accountable for the taxing and funding decisions that affect people in Scotland. Instead, for most of the run up to the next referendum, the Scottish Government (and Westminster contingent for Scotland) will be led by people, like Sturgeon and Swinney, who will remain more popular and seem more sincere and trustworthy than their UK counterparts. Of course, the case can be made for problems with the next Yes campaign, including the argument that the SNP’s economic case is redundant and the campaign has to rely on more than emotion. The alternative argument is that the SNP has been doing very well with such limited strategies, and the final devolution settlement has just strengthened its hand further. But academics don’t speak like that, so I’ll conclude by saying: (a) more research is required, and (b) please see the Special issue of Political Quarterly on this topic (introduced here). 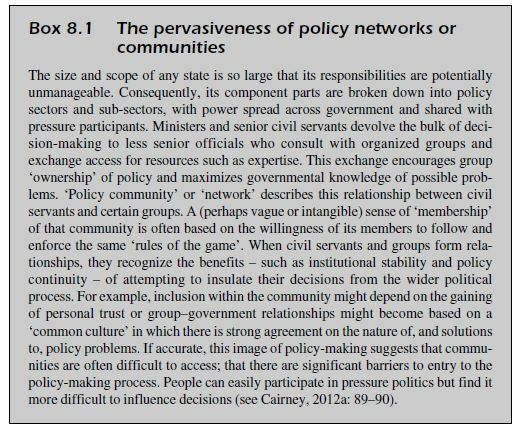 A key theme of the course is that we can explain policymaking, in most political systems, with reference to ‘universal’ concepts such as policy networks. These concepts help us identify: (a) the policy processes shared by most systems, before we examine (b) how to best understand those processes in specific systems. For example, we can link closely, but recognize key differences in, descriptions of subsystems in the US and networks in the UK. In Scottish politics, that kind of comparison tends to be with UK policymaking: can we identify the same basic processes, or did devolution prompt a ‘Scottish policy style’ that differs significantly from the ‘British style’? While Box 8.1 highlights a ‘logic’ of policy communities that is common to Scottish and UK government, it does not suggest that their processes are identical. Rather, much of the literature recounts an important story, told by participants and policymakers in Scotland, that their ‘territorial policy communities’ have distinctive features. Some participants describe ‘cultural’ differences in consultation, which can relate to our discussions of ‘new politics’ and ‘consensus democracy’, or more practical factors such as Scotland’s size, the scale of the Scottish Government’s responsibilities, and its resources to make and fund policy. 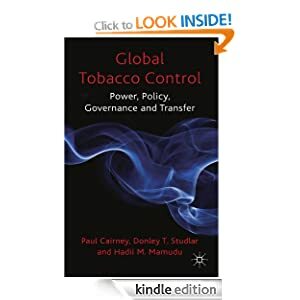 This takes place in a multi-level system in which it is often difficult – particularly for pressure participants*– to identify a Scottish process of policymaking, separate from developments at EU, UK, and local levels. a new group-government dynamic, in which groups formed new relationships with their allies (and competitors). Perhaps more importantly, groups increasingly follow a devolved policy agenda. Gone are the days of the old (pre-1999) Scottish Office, responsible primarily for policy implementation, and the tendency of groups to form coalitions to oppose or modify UK Conservative government policies at the margins. Now, groups respond to Scottish Government demands for new policy ideas, and often compete as well as cooperate with each other to draw the attention of that captive audience. The evidence suggests that some groups addressed that task more quickly than others: some groups improved on links that were already partly established (in which areas? ), some reinforced the links that they developed with the Labour government from 1997 (which ones? ), some maintained dual UK and Scottish links, to reflect limited devolution in their areas (which groups? ), and others took time to get over their opposition to devolution and find a clear role (which ones?). 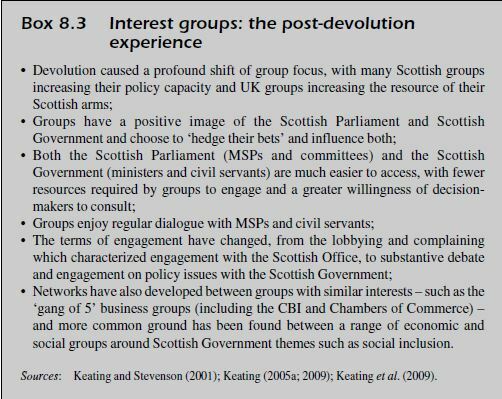 Devolution perhaps gave all groups more opportunities to engage, but this did not diminish a tendency to consult with ‘the usual suspects’. Distinctive elements of the ‘Scottish policy style’: a new policymaking culture? 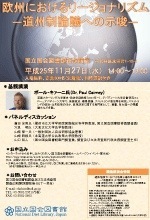 Many describe UK processes of which they have limited experience. Many describe their experiences of consultation, not influence. Some describe their greater ability to compete with other groups in Scotland, compared to their experiences in the UK. Some conflate their experiences with their attitudes to a Conservative UK government, which they opposed, and Labour-led Scottish Government, which they supported. Not all groups reported positive experiences. Still, we should not ignore completely the general feeling that something has changed, for the better. Explanations for the Scottish policy style: new politics or pragmatism? The most immediate and obvious explanation for these developments is ‘new politics’: devolution went hand in hand with the expectation that politicians and policymakers would open their doors, and their minds to new ideas. Politics would be more participative and deliberative, and policymaking would be more open and based on more regular and meaningful consultation. Scotland’s size, and the scale of Scottish Government responsibilities, allows closer personal relationships to develop between key actors. You can get all the key players in one room. The Scottish Government has limited resources, prompting civil servants to rely more – for information, advice, and support – on experts outside of government and the actors who will become responsible for policy implementation. Devolution went hand in hand with a significant increase in Scottish public expenditure. It is easier to generate goodwill or consensus on policy innovation and greater investment than on how to cut public services. Further, we can discuss another possibility next week, in relation to the ‘Scottish Approach’: if the Scottish Government was relatively keen to delegate policymaking responsibility to local public bodies, maybe it moved the trickier decisions to other policymaking venues. Maybe everyone gets together at the national level to support a vague strategy, only to struggle to influence or secure agreement on its delivery. 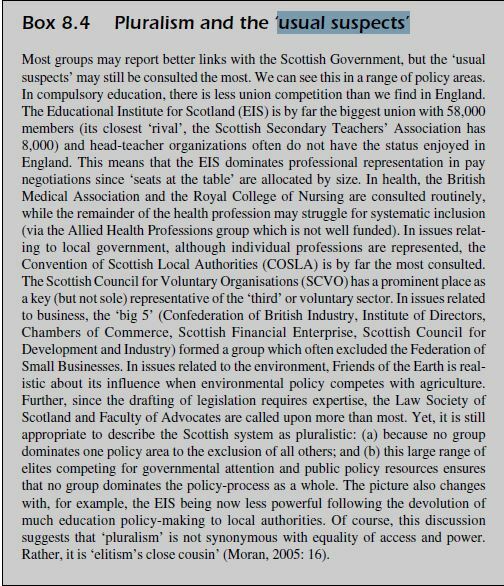 How do groups try to influence Scottish policymaking in a multi-level system? 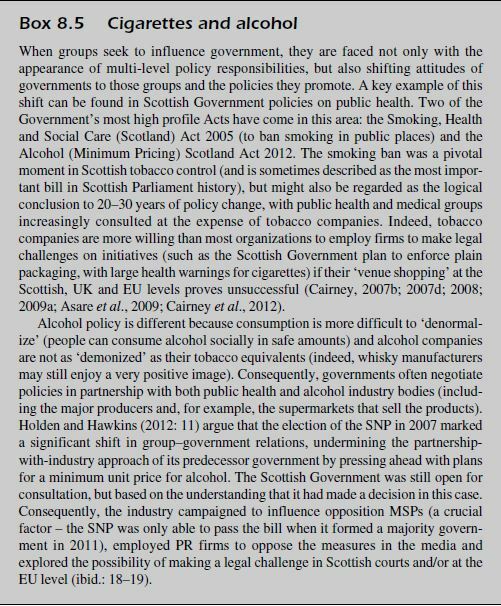 In weeks 6-7, we can discuss the extent to which the idea of a ‘Scottish policy style’ makes sense when so many policies affecting Scotland take place at other levels of government. This complication provides a major dilemma for interest groups seeking influence but recognizing the need to maintain multiple channels of access. How do they do it? Some groups only have the resources to lobby the Scottish Government, and rely on their networks with other groups to lobby UK and EU bodies. Others are regional branches of UK organizations. Much depends on the policy issue or area. For example, major banks, businesses, and unions maintain Scottish links but focus their attention largely on issues – such as macroeconomic policy, export regulations, and employment laws – reserved to the UK Government and/ or influenced by EU bodies. Groups seeking influence over environmental or agricultural policy recognise that they are heavily ‘Europeanised’. This leaves key examples of devolved areas, such as education, health, local government, and housing, in which groups are most likely to direct their attention primarily to the Scottish Government. Finally, next week we can consider the effect of the ‘Scottish Approach’ on interest groups. What will they do if the face the need to shift their attention from 1 Scottish Government to 32 local authorities and their partners? *Note: ‘Pressure participants’ is a term used by Jordan et al (2004) partly to show us that terms such as ‘pressure groups’ or ‘interest groups’ can be misleading because: (a) they conjure up a particular image of a pressure group which may not be accurate (we may think of unions or membership groups like Greenpeace); and (b) the organisations most likely to lobby governments are businesses, public sector organisations such as universities and other types of government. This week, the Scottish Government launched a new national discussion. Unlike in 2007, it is not a vehicle to promote Scottish independence. Rather, it is a way to ask people what the Scottish Government should be doing with the new powers that it will receive under the Scotland Act 2015. Does further devolution allow it to better promote both a ‘strong competitive economy and a fairer, more equal society’? The launch document lists some of the aims it wants to promote, including a reduction in gender inequality, as well as new ways to address the link between poverty and poorer outcomes relating to physical and mental health, education attainment and crime. 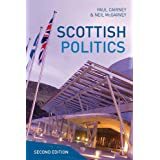 If you are not the cynical sort, it is an uplifting read, outlining progress since devolution and a range of aspirations consistent with the idea that the Scottish population would entertain social democracy if given the chance. Or, as Kirstein Rummery puts it, ‘Scotland has long maintained that it is different and fairer to the rest of the UK … now it has the means to prove it’. There are two, equally plausible, ways to describe this discussion. The first, articulated by commentators such as Kevin McKenna and David Torrance, is that the discussion is primarily a cynical exercise designed to kill time and avoid the big decisions – including major public service reforms and tax rises – that would help make Scotland fairer but its government less popular. We know what the Scottish Government needs to do, and it is time that they stopped talking and started doing. Instead, they are putting things off until at least the next Scottish Parliament election. The second, articulated by the Scottish Government, is that the talking is the most important part of the doing. The way we make policy matters. It’s time to stop just making decisions for people or, at least, first ask them what we should do. It’s time to stop making policy from the top down. Let’s involve people and communities in policymaking, make the big decisions together, then invite local communities to make sense of broad aims in specific areas. That way, some of the decisions may be controversial, but you can demonstrate that you listened to people’s concerns, responded to their suggestions, and made sure that plenty of people are behind you. Somewhere in between those positions you have people like me, who remain optimistic, but want to talk through the problems before getting too excited. Here is my top three. First, the new devolution settlement, produced after ‘negotiations’ between elected politicians and government departments, is a horrible mess. I genuinely don’t understand the settlement or know what the Scottish Government can do with it. Second, anyone who tells you that public sector reform makes complex government simpler and saves you money is selling you snake oil. Instead, it’s a long term investment for the future, at a time when the government’s main driver is to spend less to balance the books. Third, we have not resolved the central/ local question. Instead, this discussion should reinvigorate a debate about how national we want policy to be, to ensure uniform entitlement to benefits and services, and how local it should be, to allow governments to tailor policies to local needs. We want both, but we shouldn’t pretend that life is that simple or that the dichotomy is false. At the end of the day, my gut tells me that the Scottish Government will try to make a difference but will start with the low hanging fruit. Some modest reforms, addressing the hot button topics like the ‘bedroom tax’, and based on trying to see the system through a service user’s eyes, can make a genuine difference and help maintain the SNP’s reputation for governing competence. It will not, however, produce the fundamental change – or genuinely redistributive policy – that some might associate with a ‘fairer Scotland’. It is 19 years since George Robertson declared famously that Scottish devolution would ‘kill nationalism stone dead’. It remains one of the most important, symbolic, phrases because it sums up one of the worst sentiments in British politics: constitutional change seems, too often, to be a stitch up by one or more political parties at the expense of the others. Too often, we have seen unionist parties produce deals amongst themselves rather than engage meaningfully with nationalist parties like the SNP. The main result is that Scottish constitutional change often seems out of step with the national mood. The Calman Commission, established in 2007 by Labour, the Liberal Democrats and Conservatives, produced the Scotland Act 2012 that seemed out of date before it was implemented. The Smith Commission was established in 2014 and, although it produced its recommendations in a ridiculously short space of time, they already seem like the starting point for discussion, not a new devolved settlement. Yet, it was not always this way. For a brief period, from devolution in 1999, we talked more about ‘new politics’ than independence. This is partly because many of the parties involved were more inclined to do the right thing than Robertson’s comment suggests. Scottish Labour didn’t hold hands with the SNP, but it made sure that it got SNP support during the Yes to devolution campaign in 1997. The parties (including Scottish Labour, Liberal Democrats and what would become the Scottish Greens) also thought about how political reforms would go hand in hand with constitutional reform, encouraging some debate about new forms of deliberative and participatory democracy. They engaged ‘civil society’ groups, and the campaign for devolution had a strong focus on gender and the participation of women in public life. In short, they had a Scottish Constitutional Convention. This period of reform in the 1990s should provide some lessons today. It is too tempting to argue that the incredible rise of the SNP, and its likely dominance of Scottish seats in Westminster, will produce a constitutional crisis – a UK party only governing with the consent of the SNP will reinforce a broad sense that ‘The Scots appear fed up with the English, and the English with the Scots’. Simon Jenkins suggests, rather provocatively, that the current union is dying and that ‘Some new format is required that must embrace parliamentary disengagement, devo-max or indie-lite or whatever. The task for Cameron or Miliband is to be architect of that format’. Yet, this conclusion is not inevitable and the solution is not quite right. In particular, we do need to rethink the plans for further constitutional change that were produced so hastily by the Smith Commission for the sake of party politics rather than sensible constitutional redesign. However, a new constitutional convention should be the architect, not the leader of one political party doing a deal with another. If you look at the rhetoric of the main parties, a new convention in Scotland is just the ticket. It suits Labour’s ‘no deals with the SNP’ stance, since a convention is a way out: it could be portrayed as an attempt to go beyond party politics and engage Scottish civil society. It suits the SNP, looking to maximise its influence but not be stuck with the idea that all it wants is ‘devo max’ or ‘full fiscal autonomy’ as a stepping stone to independence. It might even suit the Conservative party if it squeaks into government again with the Liberal Democrats, since a convention may be the only way to generate a sense of legitimacy in Scotland if it has few or no MPs in Scotland. The alternative for the UK parties (apart from the UK-wide convention proposed by Labour, which seems separate from Scottish reforms) is to stick with Smith and exclude the SNP, which seems like an untenable position for parties that claim to want to reform the Union to protect it. Only the SNP benefits from the stand-off, and only a constitutional convention provides anything close to a competing story of Scottish legitimacy to the one crafted so well by the SNP. In part two, I outline a list of topics which we might discuss further in the question and answer session. At the heart of the ‘future of British politics’ issue is the question: will Scotland remain a part of it? In the short term, the answer is ‘yes’. On the 18th of September 2014, 55% of the voting population voted No to the question, ‘Should Scotland be an independent country?’. In the long term, it is impossible to tell. The referendum was often described as a once-in-a-generation opportunity to vote for independence. Yet, it is realistic to expect another referendum in 10 years. This event would form part of a longer term trend, in which the constitutional changes, designed to represent a devolved settlement in Scotland, have not solved the problem – partly because the problem changes or is articulated in new ways. the ‘top down’ imposition of unpopular policies in Scotland by the UK central government, often before they are introduced in the rest of the UK (such as the ‘poll tax’). the promotion of British policies without sufficiently distinctive Scottish arrangements. Devolution represented ‘unfinished business’ (since a referendum in 1979 produced a small Yes majority which did not meet a required threshold) and subsequent opposition to Conservatism helps explain a rise in support for devolution. A frequent argument is that devolution could have ‘defended Scotland from Thatcherism’, and allowed the maintenance of Scottish traditions of participative democracy and social democracy. Yet, as we saw in the independence debate, devolution was often described as a poor solution to the democratic deficit. Devolution was described famously by former Labour Shadow Scottish Secretary, George Robertson, in 1995, as the opportunity to ‘kill nationalism stone dead’. Ironically, it is more accurate to say that the independence referendum could not have happened without devolution. The introduction of the Scottish Parliament gave an in important new platform to the Scottish National Party (SNP). In 1999 and 2003 it was the second largest party (behind Scottish Labour). In 2007 it became the largest party (47 of 129 seats – Labour had 46) and formed a minority government. From 2007-11, it had insufficient support to pass a bill to hold an independence referendum. Yet, 4 years of government allowed it to develop a strong image of governing competence, which became one of the most important explanations for its major election victory in 2011 (the other is that the Scottish Parliament’s electoral system is not fully proportional – it combines plurality and proportional elements). It secured approximately 45% of the vote, which allowed it to gain a small majority of Scottish Parliament seats (53%, or 69 of 129). The formation of a majority SNP government in the Scottish Parliament gave it enough support to pass a referendum bill, while the appearance of a ‘landslide’ (a major electoral victory which signals a strong momentum) allowed the SNP’s leader, Alex Salmond, to argue successfully that it gave the SNP a mandate to pursue the referendum. This event became an important way to secure the UK Government’s agreement to support the process (note that this support does not exist in, for example, Catalonia/ Spain). The independence agenda has prompted Scotland’s other main parties (Labour, Conservative, Liberal Democrat – all of which are part of British parties) and the UK Government to consider further devolution; to try to produce a devolved solution that will settle the matter once and for all. 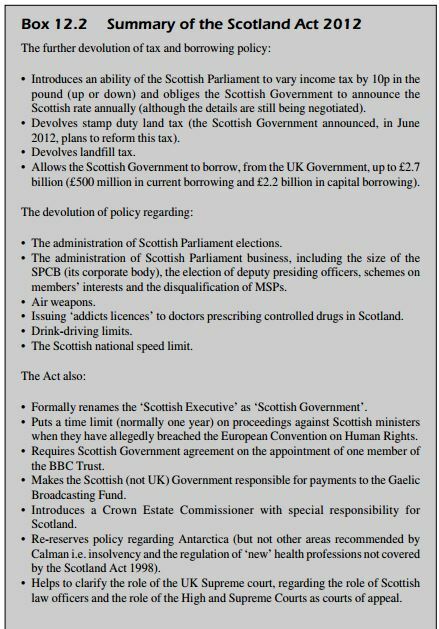 The Calman Commission recommended further devolution in 2009. It prompted the Scotland Act 2012, to introduce further tax devolution (part of income, land and landfill taxes), the ability of the Scottish Government to borrow to invest in capital projects, and new powers in areas such as Scottish Parliament elections, air weapons, driving and drug treatment. The Scotland Act 2012 was designed to be implemented after the referendum, giving opposition parties the opportunity to guarantee further devolution after a No vote. make the Scottish Parliament ‘permanent’. devolve some fiscal powers, including the power to: set income tax rates and bands (higher earnings are taxed at a higher rate) but not the ‘personal allowance’ (the amount to be earned before income tax applies); set air passenger duty; and to receive a share of sales tax (VAT). increase the Scottish Government’s borrowing powers. devolve some aspects of social security, including those which relate to disability, personal care, housing and ‘council tax’ benefits (council tax is a property tax charged by local authorities to home owners/ renters and based on the value of homes). devolve policies designed to encourage a return to employment. devolve the ability to license onshore oil and gas extraction (which includes hydraulic fracturing, ‘fracking’, for shale gas). control the contract to run the Scottish rail network. encourage greater intergovernmental relations and a more formal Scottish Government role in aspects of UK policymaking. The UK Government now aims to produce draft legislation to take these plans forward, although the bill will not be passed before the general election in May 2015. To a large extent, the proposals reflect the plans of the three main British parties, rather than the SNP (which requested ‘devo max’), although they go further than those parties would have proposed in the absence of the referendum agenda. Again, they are designed to represent a devolved ‘settlement’, reinforced by the knowledge that 55% voted against Scottish independence in 2014 (the turnout was 84.6%). The new plan may represent the largest amount of devolution that is possible if Scotland is to remain in the UK. However, it does not address all of the charges associated with the ‘democratic deficit’. The ‘spectre of Thatcherism’ is still used by proponents of independence, and a period of Conservative-led government has been used to identify the potential for the ‘top down imposition’ of ‘neoliberal’ policies to continue in some areas, and for economic policy to remain focused on the south-east. It is still used to suggest that only independence could secure a Scottish consensus democracy. This narrative has only been addressed to some extent with the devolution of symbolically important responsibilities – including the ability to remove the so-called ‘bedroom tax’ (an unpopular policy associated strongly with Conservative-led welfare reform), reform local taxes (associated first with the ‘poll tax’, then the difficulty of the SNP to abolish the ‘council tax’ in favour of a local income tax), and administer benefits related to personal social care (associated with a longstanding dispute between the Scottish and UK Governments on ‘attendance allowance’). The SNP remains remarkably popular. Its membership has risen dramatically since the referendum, from 25,000 to over 92,000 and it is now the third biggest party in the whole of the UK despite Scotland having only 8% of the UK population. Its leader, new First Minister Nicola Sturgeon, is one of the few to maintain a positive popularity rating in opinion polls. Current polls also suggest that the SNP will gain ground in the UK election in 2015 and maintain a strong position in the Scottish Parliament in 2016. There is majority support for a referendum in the future. A second referendum would have a clearer sense of what people are voting for. In 2014, the ‘Vow’ allowed people to vote No and expect further devolution. In the future, the debate would be more simply about Yes or No to independence (albeit an independence that does not mean what it used to mean). What were the most important debating points? Examples include: the use of the pound as the Scottish currency, the future economic health of Scotland, and the future of important public services such as the National Health Service. What are the limits to further devolution? ‘Devo max’ is the idea of devolving everything except foreign and defence affairs. It is not possible to devolve all tax and spending responsibilities (partly because European Union rules prevent it), and was never going to happen (at least while people support the idea of a United Kingdom which keeps the pound as its currency). Should we try to explain why the Yes campaign lost or why it did so well? Why is the Barnett formula so controversial and important to the debate? Is the referendum debate about securing powers in principle or using them for particular purposes such as social democratic? Would independence have produced a new system producing policy in a different way? Is the Scottish population more left wing and does this produce more demand for independence or different parties? 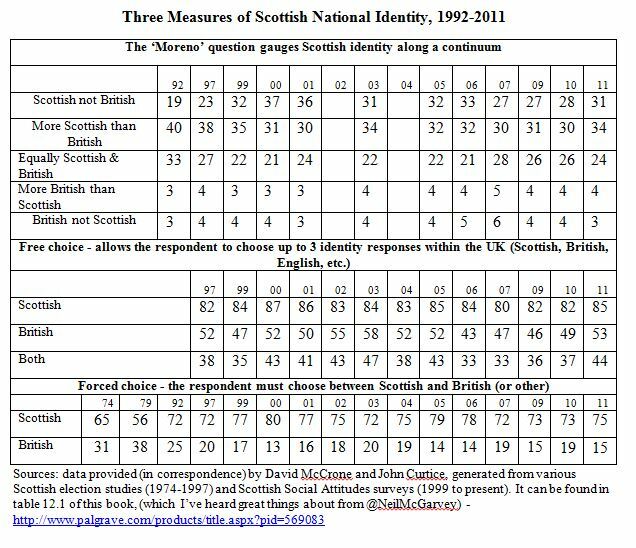 Does national identity drive support for independence? Is the Scottish further-devolution agenda tied closely to the wider UK debate on its constitutional future? Before the referendum, there was some prospect of a UK constitutional convention. Now, our short term focus has returned to Prime Minister David Cameron’s promise to address the idea of ‘English Votes for English Laws’ (EVEL) to address the so-called ‘West Lothian question’. What has been the reaction in the rest of the UK to the Scottish debate? One suggestion, in some of the media coverage, is that there would be an English ‘backlash’ prompting UK politicians to ‘get tough’ in any negotiations with the Scottish Government. Yet, the evidence for this assertion is not clear. What is the effect of Scottish devolution on Wales and Northern Ireland? 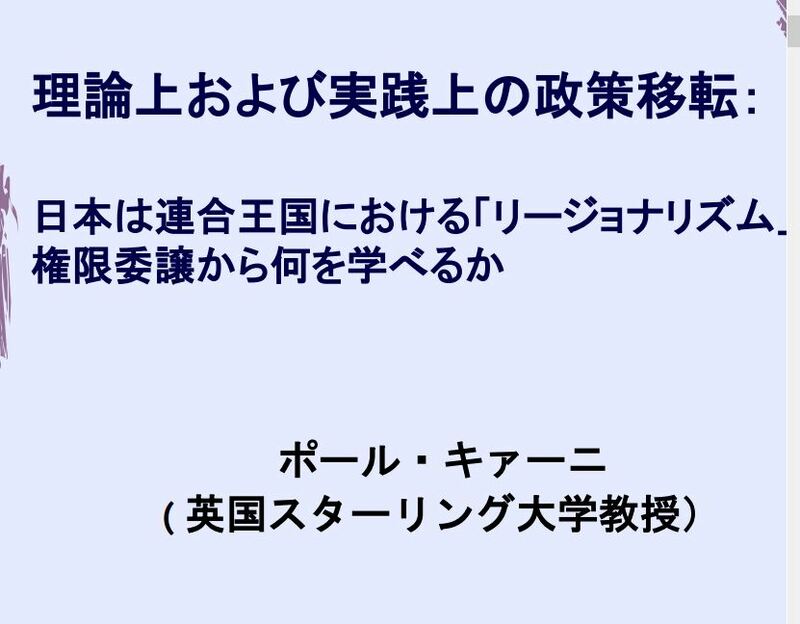 [i] I have written this document in essay form to keep it short and easier to translate into Japanese. 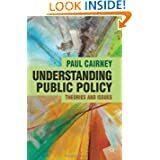 I draw on a series of posts on my blog – https://paulcairney.wordpress.com/indyref/- and books such as Cairney, P. and McGarvey, N. (2013) Scottish Politics (Basingstoke: Palgrave). My points may look descriptive and factual, but it is impossible to summarise this debate in a non-political way.